This is a varied and quite demanding program showing you Kazakhstan from different angles. Travelling by car, train and plane you will realize how big – and empty – Kazakhstan is. The steppe in the south and center can be endless, the mountains and mountain lakes nearby Almaty are breathtaking. You will watch and engage in urban and in countryside life, notice the impact of both nomadic and Soviet culture in present-day Kazakhstan. You will depart from your home country to arrive next day in Astana, Kazakhstan. (International arrivals in Kazakhstan tend to be at night). After arrival at night in Astana you will be transfered to a 3* hotel in the city (half an hour drive). 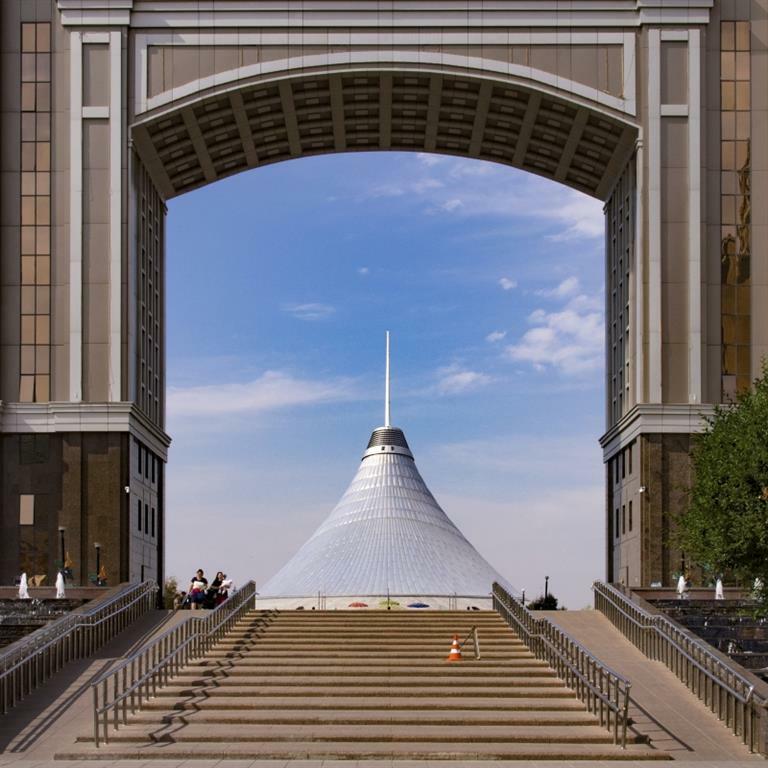 You can catch up with some sleep and in the course of the day will be offered an excursion in the modern part of Astana with its fantastic new architecture, amongst which the landmark Baiterek Tower and the (pyramid shaped) Khan-Shatyr shopping- and entertainment center. In addition, and quite in contrast, you will visit an old prison-turned-museum at 35 kms from the city. This complex, called Alzhir, used to be in Stalin’s times a prison for women of so-called traitors who were forced to labour in one of the numerous camps or coal mines in the vicinity. After returning to Astana you have leisure time. Depending on the exact flight time you will head for Kyzlorda in the south-west of the country today by plane, and onwards by train for another 400 kms to the former port of Aralsk. This town, now 200 kms removed from the Aral Sea, is the most westwards point of the tour. You will arrive around midnight and be transfered to the home of a local family for accommodation. Aralsk used to be a proud port on the Aral Sea. Not anymore, since the sea is now hundreds of kms away… Today you will have a look at the last remaining wreckages of stranded ships; collectors of scrap metal take care that also these last few ones will have completely disappeared soon. Please note that in this case the excursion may be changed. After that you will enjoy an excursion to the Aralsk museum about the lake and port. You will stay with locals. Today you have the opportunity to investigate Aralsk by yourself. Late in the evening you will head for Turkestan, some 800 kms to the east, by train (sleeper). Arrival in the next morning. In the morning you arrive in Turkestan, and will be transfered to hotel Edem. For today an excursion is planned to the Mausuleum of Hodzha Ahmed Yassawi. Built between 1389 and 1405 in memory for the prophet Hodzha Yassawi, this complex of buildings is one of the most beautiful and important from Timur’s reign. Afterwards you have leisure time. Today you will be transfered by car to the Aksu-Jabagly nature reserve, on the way visiting the mausoleum of Aristan Bab and the ruins of Otrar in a desert like landscape. Otrar was once a flourishing Silk Road town demolished (like so many) by the Mongols. You continue till the mountain ranges bordering Uzbekistan and Kyrgystan and reach the village of Jabagly, gate to the Aksu-Jabagly nature reserve, where you will be accommodated in a nice guesthouse. Dinner is included today. After breakfast you will enter the reserve by 4WD head (the oldest reserve in Central Asia), and situated in the high mountains with peaks over 4,000 meters. Flora and fauna are rich here, a.o. the evasive snowleopard and brown bears are roaming the mountains! You’ll have a lunchbox with you, hike a lot and return to the guesthouse in the evening, dinner included. Optionale: horse-riding (cost of renting a horse not included in the offer). Another day in the nature reserve. Today a visit to the imposing Aksu canyon is planned, with plenty of hiking. The Aksu river has carved a wonderfully bizar canyon into the landscape. Like yesterday you’ll bring a lunchbox with you and will stay one more night in the cosy guesthouse where dinner is included. After breakfast you will be transfered to the Tjulkebas railway station at 20 kms from Jabagly to catch the train to Taraz (100 kms). Upon arrival you are transfered to a hotel and in the afternoon will enjoy a city excursion. Taraz celebrated its 2,000 years anniversary in 2002, as a result of the fact that it was being mentioned from early on as a stop-over on the Silk Road. You will visit the history museum, the mausoleums of Alye Ata and Aisha Bibi, and a restored old caravanserai. 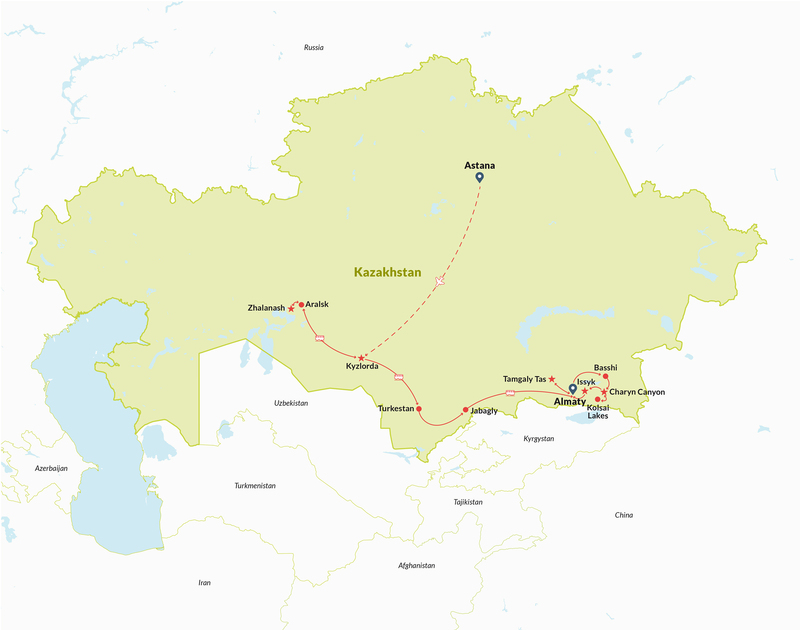 At night you will be transfered again to the railway station to catch the sleeper to Almaty, 700 kms eastwards. Early morning you arrive in Almaty, where you’ll be transfered to a hotel and have some time to rest. After lunch time a city excursion is organized, visiting a.o. the Panfilow park, the Zenkow Cathedrale and the museum for musical instruments. A completely different part of your tour starts today. In five days, seated in a 4WD with a driver-guide, you will visit the natural highlights of the Almaty Province. This south-eastern part of the country offers a great variety of landscapes on a relatively small territory, from steppe and semi-desert to the high mountains. Meanwhile you will experience life in the Kazakh countryside. Accommodation will be mostly in guesthouses. The first day will bring you to the Kapachagai reservoir and Altyn Emel national park, both situated north and north-east of Almaty. With 5,200 kms2 Altyn Emel is Kazakhstan’s largest national park and in this landscape of semi-deserts and rocky mountains you may spot some wild donkeys and gazelles. For the whole countryside tour outside Almaty all meals are included. Today you’ll have lunch in a small cafe along the route and dinner in hotel Altyn Emel, also your accommodation for the night. Another day in Altyn Emel. Today you will head for the Aktau and Kakatau mountain ranges, wonderfully white resp. red colored. Of course plenty of hiking is included. Accommodation a guesthouse in the village of Basshi. Quite a journey today, from Basshi in southern direction close to the border with Kyrgystan through mainly empty steppe, sometimes crowded by herds of sheep, cattle or horses. Between the end of May and mid September semi-nomads live in these region, living in their yurts. The first of the three Kolsai mountain lakes is situated at 1,818 meters. It’s a wonderful area for hiking, horseriding (optional) and relaxing. Accommodation is in a simple but nice homestay in the nearby village of Saty, where also dinner will be served. Today, after lunch, you will enjoy the excursion by nostalgic Soviet jeep to the remarkable Kaindy lake (see picture below). You will spend one more night in the homestay in Saty. During the day a short transfer by car will bring you to the first Kolsai lake, at an altitude of 1,700 meters. From there you may hike to the second lake, a 9 kms walk however with a 550 meters ascend – and back. Alternatively you may rent a horse (plus guide) for a spectacular ride to the second lake. The cost of renting a horse is approx. €20 for the day. The third lake is situated another steep 6 kms from the second lake at 2,650 meters, which is too far for a day trip for most people. Return to Saty and accommodation. Lunch (from a lunch box) and dinner are included today. The return to Almaty is initiated, but not before having some adventures in between! 110 kms after leaving Saty you will visit Charyn Canyon, the most spectacular natural phenomenom of the Almaty Province. Dwell around and enjoy. Continuing to Almaty you will stop at a small but remarkable museum about ‘berkutchi’, which means hunting with eagles in Kazakh. There are real eagles on show as well! Lunch you will enjoy in a roadside cafe, arriving in Almaty in the evening, where you will be taken to your hotel. The last excursion of the tour brings you to the well-known site Tamgaly Tas as 170 kms from Almaty, with ancient rock paintings from the Bronze Age. It’s a UNESCO protected site. Lunch on the way, accommodation in Almaty. This day you have for yourself. Our guide can give you all mind of advise regarding places to hunt for souvenirs, local museums, good places for hiking etc. Accommodation in the same hotel. A second and last free day in Almaty. You may take a taxi to the Medeo and Chymbulaq region just south of Almaty, take the lifts all the way up and enjoy the panorama as shown below. At night or in the early morning you will be transfered to Almaty Airport for your flight back home. The cost of this program at six persons is €1,300 p.p., at four persons €1,460 p.p. and at two persons €2,150 p.p. For other group sizes please write us for an offer. – 17 nights in 3* hotels and guesthouses, on the basis of bed & breakfast and in double rooms. You may choose for 4* hotels in Astana & Almaty at €100 per person extra. – services of English speaking guides during all excursions and during the mini-tour in Almaty Province. Optional: this 5-day mini-tour from Almaty without a guide and just a driver. Savings €450 in total. Not included in the offer are the international flight tickets, the remaining lunches and dinners, the flight ticket Astana-Kyzlorda (cost from USD 45-130 p.p.) and all not mentioned services.